Northumbrian Water is set to commence an upgrade of their Seaton Carew Headworks and Seaton Carew Sewage Treatment Works, with a project value of around £7.7m. Interserve Construction is the appointed contractor on the project which is expected to commence on August 10 and complete in June 2016. The purpose of the upgrade is predominantly to protect Hartlepool’s bathing water quality and reduce the risk of flooding to nearby homes. Machinery used to treat wastewater will be replaced and upgraded and new treatment systems will be installed. The sites currently serve 155,000 people in Billingham, Hartlepool, Seaton Carew and surrounding areas. 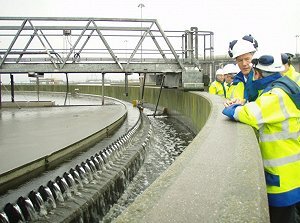 Seaton Carew Headworks provides a preliminary treatment of sewage which screens and removes grit from wastewater before transferring it to Seaton Carew Sewage Treatment Works for three stages of additional treatment. The treated flows are then pumped back into the Headworks and returned safely into the environment. Northumbrian Water’s project manager, Dean Thompson, said: “Protecting and enhancing the environment is at the heart of our business and the project in Seaton Carew will help us to sustain this. This specific project forms part of Northumbrian Water’s £150m programme in AMP6 to upgrade and maintain its 412 sewage treatment works, for which the company plans to invest over £150m between 2015 and 2020.